Guinea pigs are mostly very sociable animals, and love nothing more than spending time with humans and other cavies. However, like all of us, they occasionally want some peace and quiet away from their cagemates. There are various types of guinea pig house available which provide your pets with the perfect hiding place, allowing them to get some alone time when they need it. You need to provide your cavies with plenty of shelters. You should give them at least one per pig, and preferably have one or two extras as well, so that they've got several to choose from. Rather than getting several identical houses, choose a variety, as each pig will have his or her own favourite hideaway. Never disturb your cavy when it is in its house, as they can become agitated and even aggressive if their rest is disturbed. They'll soon come out of their own accord, and be ready to play again. There's no need to put hay or any other bedding in your guinea pigs' houses - if they want it, they'll take it in themselves, but usually they're perfectly happy without it. These are very popular and should be your first choice. A typical house has solid walls, an open door, and one or two windows. There are various different types available, from simple houses, to log cabins, and even multi-storey homes with ramps connecting the floors. Most are fine, but remember that looks aren't as important as function, and a simple house is usually best, not to mention cheapest. You can buy a wooden house or make your own. Image by Keren. The best homes have no floor, which means that your pets will be able to sit on their soft, hay-lined cage floor, rather than a hard wooden one. This also has the benefit of soaking up and urine. It also makes it easier to get your pig out of the house in an emergency. 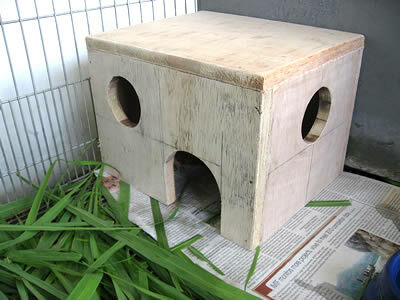 A major benefit of wooden guinea pig houses is that they can also be used to help keep their teeth short. Guinea pigs' teeth continue to grow throughout their life, and they keep them trimmed down by chewing and gnawing on hard objects. Wooden housing is perfect for this, as the wood has the right level of abbrasion, and they are usually much more sturdy than a chew toy. Made from hard plastic, these are available in a wide range of colours, which means they can look more interesting in your pets' cage. 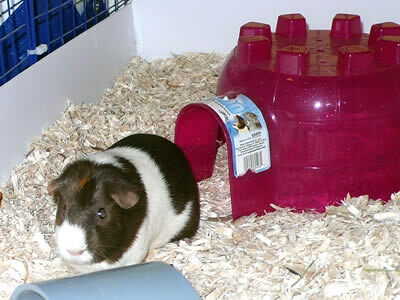 A typical guinea pig igloo has a large domed area with a narrow tunnel leading off it. Some of these tunnels can be very cramped, making it difficult for your cavies to get in and out - if this is the case, you can trim off the top of the tunnel to give them more room. Plastic igloos make a great, cosy shelter. Image by yourFAVORITEmartian. Some come with a built in plastic floor. These cause droppings and urine to collect in the igloo, meaning that it has to be cleaned out daily (thankfully, being plastic, they are easily washable). Where possible, get one without a base. You should be aware that plastic can cause digestion problems if swallowed, and can even be toxic. If your pigs are nibbling at their igloo, you should remove it from their cage, or give them a chew toy to try and encourage them to chomp on something else. These are just like miniature versions of the tents that you would go camping in. They are made from nylon, which can be easily machine-washed to get rid of any stains or marks, and most come with a removeable fleece floor which helps to provide extra warmth. Tents are warm and easily washable. They are perfect for use in your cavies' cage or playpen, giving them a warm, cosy place to spend some time alone. They can also be put in your guinea pigs' run to provide some shelter from the sun. 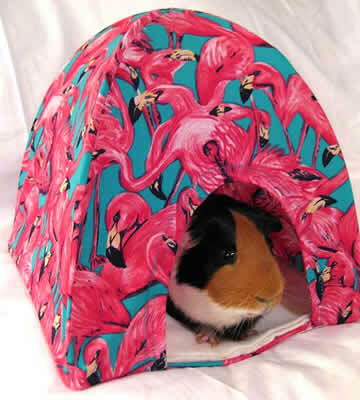 You can buy guinea pig tents from manufacturers such as Trixie, Pets At Home, and Boredom Breakers. They each make different types, including wigwams, pop-up tents, and even ones that hang from the roof of your animals' cage. A large paper bag is a great retreat, and can also be torn up to be used as bedding. Simply lie it on its side in your animals' cage and, if necessary, use some hay to prop it open. Note that these will usually become soaked with urine quite quickly, and will need to be thrown away. These provide a more rigid shelter for your pets. A shoe boxes or similar is ideal - simply cut some holes for your pigs to scamper in and out of, turn it upside down, and pop it in their cage. There are a great way to make a comfortable, dark area for your cavies to hide. Simply drape a small towel in the corner of the cage, clip the corners to the bars using pegs or bulldog clips, and put a heavy object on the loose end to hold it away from the cage walls. They are quick to make and easy to wash, but do have a tendency to get tangled up, so you might need to straighten them out from time to time.